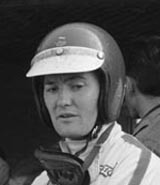 Jonathan Williams got into motor racing after meeting Piers Courage at Chelsea College and soon became involved in a group of enthusiasts which included Frank Williams. In 1962 he started racing Minis, moved to Austin A40s and then bought a Formula Junior Merlyn which he immediately crashed at Monaco. With Courage he co-founded Anglo-Swiss Racing and acquired a Formula Three Lotus. In 1965 he joined Charles Lucas Engineering (Lucas was another Chelsea College acquaintance) and after a decent season he was offered a deal to drive for De Sanctis, replaying their faith with a brace of wins. That, in turn, attracted the attention of Ferrari for 1967 and after a season of Formula Two he made his Formula One debut at the Mexican Grand Prix, finishing eighth. He completed a hat-trick of wins in the Monza Lottery in 1968 but by then Ferrari were looking elsewhere and he quit, although he continued to stay involved in sports car racing. At the 1970 Le Mans 24 Hour he co-drove the Porsche 908/02 which carried cameras for the Steve McQueen movie Le Mans. He learned to fly, moved to the south of France and became a pilot of executive jets.